Over 30 years ago, I had a wonderful dream of Srila Prabhupada which is still fresh in my mind. 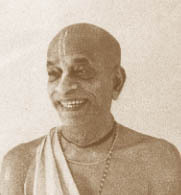 Prabhupada was sitting in the prasadam room at the old Vancouver temple. Golden rays of pure love were emanating from his spiritual body. As each successive wave of Prabhupada's love flooded my heart, I was overwhelmed with endless bliss. It was beyond this world. As I gradually awakened, a deep voice resounded in my heart: "Not until you surrender."